You can mentor individually, or tag-team. Future City is a middle school STEM outreach program where students design their city of the future. This city is complete with infrastructure: including transportation, communication systems, power plants, safety systems, water systems, and green spaces. Students utilize SimCity™ software to build their virtual city. They create a scale model, write an essay, and finally, make a presentation to a panel of judges. As these students address important issues such as accessibility, sustainability, pollution, population density, water resources, traffic flow, and budgets, they develop important competencies. They receive input from both their teacher and mentors while going through the program management process, and benchmarking. They work as a team, develop their problem-solving abilities, learn how to conduct research, and perfect their presentation skills… all tools they need in the real world. The competition is scheduled for Monday, January 26, at the Suburban Collection Showplace in Novi. These kids deserve to attend the final competition. They need to “complete” before they “compete.” There are a multitude of awards that they have the opportunity to win, aside from 1st-5th place. Please help them get there. 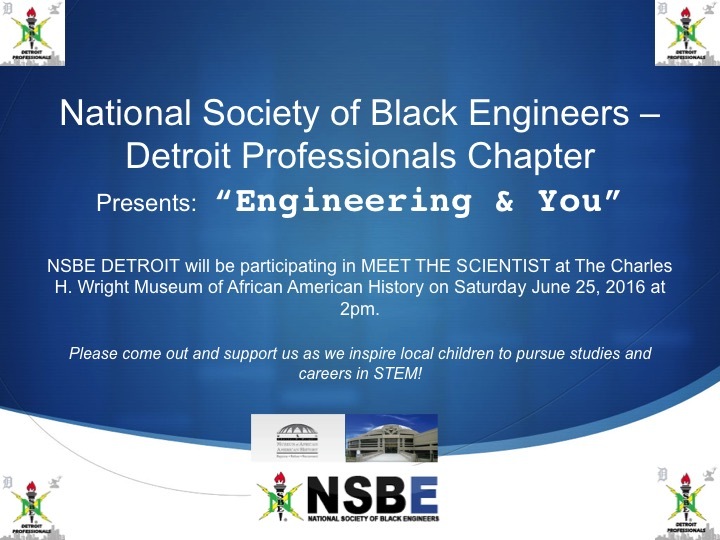 Contact nsbedetroit@gmail.com Allison Marrs at 248-353-0735 x121 or amarrs@esd.org , if you wish to register yourself or a team as mentors! See flyer for more details. 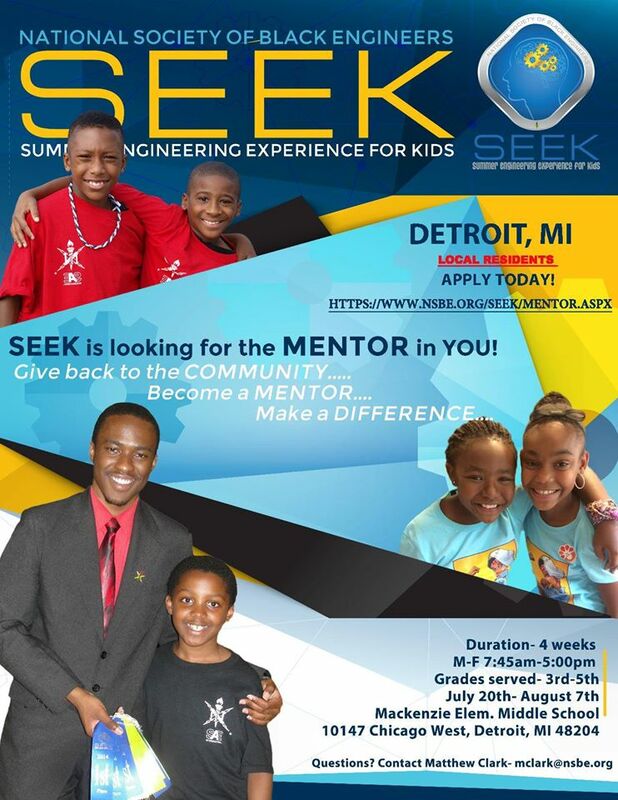 The Tuskegee Spirit Program sponsored by the Detroit Catholic Pastoral Alliance Chapter is looking for a couple of NSBE members to support Robotics team(s) on 10/25/14, 11/15/14, and 11/22/14. All who are interested should contact Pinel Romain at pinel.romain@gmail.com or 313.623.5642. The University Prep Science + Math High School Chapter is looking for speakers to talk about their career choices and experiences. Chapter meetings are Mondays at 3:30 PM. All who are interested should contact Josiah Walker via. LinkedIn or at jjwlibra@gmail.com.